يقع مانترا سيتي سنترال في Melbourne CBD, ملبورن, هو خيار شائع بين المسافرين. يقع الفندق على بعد 0km من مركز المدينة، ويؤمن الوصول إلى أهم مراكز المدينة. سوف يعشق النزلاء موقع هذا الفندق، فهو قريب من أهم المعالم السياحية في المدينة كمثل Chic Empire Ugg Boots, Emporium Melbourne, ‪St. Francis Church‬ . كما يقدم مانترا سيتي سنترال الكثير من الخدمات لإغناء رحلتك في ملبورن. لضمان راحة ضيوفه، يقدم الفندق الخدمات التالية: خدمة التنظيف يوميًا, تسجيل وصول/خروج سريع, تخزين الأمتعة, صف السيارات, رعاية أطفال . ادخل إلى واحدة من الغرف 61 وتخلص من عناء نهار طويل بمساعدة مجموعة كبيرة من الخدمات كمثل تلفزيون بشاشة مسطحة, غرفة معيشة منفصلة, غرف لغير المدخنين, مكيف هواء, تدفئة الموجودة في بعض الغرف. كما أن مجموعة الخدمات الواسعة الموجودة في الفندق لضمان راحتك تترك لك الكثير من الخيارات لقضاء وقتك أثناء فترة إقامتك. مهما كانت أسبابك لزيارة ملبورن، فإن مانترا سيتي سنترال هو الخيار الأفضل لإقامة مثيرة وممتعة. يمكن الوصول إلى غرفة النوم والحمام في الشقق المكونة من غرفتي نوم عن طريق السلالم فقط. Nice loft style studio apartment on the doorstep of Melbourne CBD. Ideal as I was travelling with a 5 year old and didn’t want to have to walk too far for meals, transport and attractions. Bed was comfortable. Minimal night noise (Sunday night). Would definitely stay again. The location is excellent if u like to be in the city centre for shopping. Plenty of food options nearby too. The only issue I have was with the late night check-in. We need to press a call button when we arrived because it was past midnight and we waited for a good 10 minutes before someone answered the call. Hope that can be improved. right in the heart of the shopping district, close to train station, tram stops and restaurants. On arrival greeted by the lovliest man. Upgraded to a 2 room apartment without having to ask. The rooms were nicely furnished. Bathroom was dated but clean. Front desk was happy to help with directions. Free computer with internet was provided in the foyer. Would definitely stay here again. Great hotel, clean, great people. the location is second to none, easy access to trams and all public transport. I have booked this place for next week and also for the week after Christmas for work. Easy to get to from the airport and easy access to al that the city has to offer. 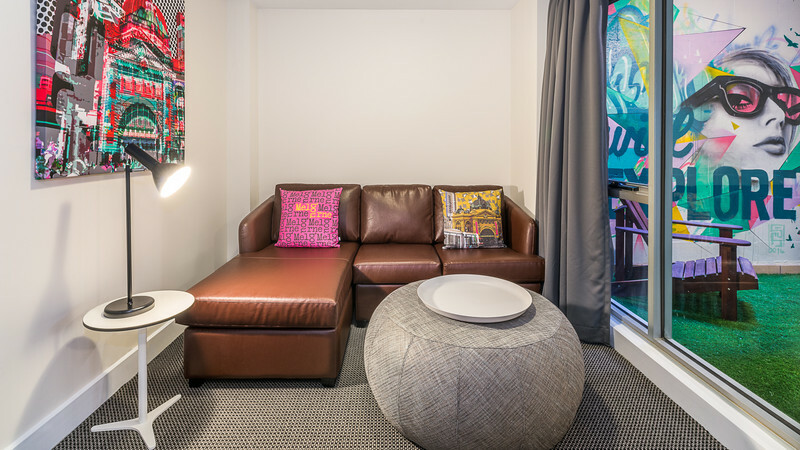 Recommend grabbing the free tram that goes around the city and getting off at Flagstaff Gardens for the Victoria market (About 10 minutes from the hotel)but take a big bag..
You have to take note that this is a SOHO apartment. so the bedroom is upstairs, you need to take a stair. Not recommended for older couples. Great location though, unbeatable. We stayed here with the listing on agoda specifying "City Views" our view was actually a grey wall as most of the building is up against a shopping mall complex. There was no natural light in our room and it felt very crammed in. We did ask to move rooms but there was nothing available. I felt very closed in here. It was a good location and good to have a sitting area but I wouldn't stay here again. Loved the loft style set up... reminded us of being in France. The bed upstairs was a tad warm but there was a fan there to help cool it down. Awesome location, friendly staff... I'm definitely coming back - loved it! Reception provided efficient and friendly service, nothing was too much trouble. We stayed 2 nights wanting to be in the centre of everything, had a comfortable good size room with good facilities and a super comfy bed. The hotel is very central to shops, food outlets and train station. I had absolutely no complaints and will stay there again. Great location in the middle of the city, though parking would be an issue, as it always is in the city. Close to Bourke Street Mall, Myers, David Jones. Tram stops are close by so it's easy to get around. Located on Little Bourke St, the central of shopping area, you cannot ask for any better. The apartment is spacious, coupled with a beautifully furnished balcony that overlooks the city landscape. Staff are friendly as well. In CBD, location is everything and Mantra City Central smacks right at the heart of Melbourne City. Just do note, if you're driving, the parking is ard 150m away and parking fee ain't cheap for a day (Cost me avg 60aud per day. ) Room is clean and exceptional quiet , even though we stayed on the 2nd floor. Staff is friendly as well as I was able to borrowed an umbrella to shelter myself to the carpark to collect my car before returning. Mantra City Central is great value for money and the location is seriously perfect! The bar in the alley way was the biggest negative to our stay. We were located on level one and stayed Saturday/Sunday night and the music and patrons were quite loud. Lucky for us, we were so tired so crashed. Definitely ask for a room on the opposite side or a higher level! We had a fantastic stay at the Mantra City Centre. 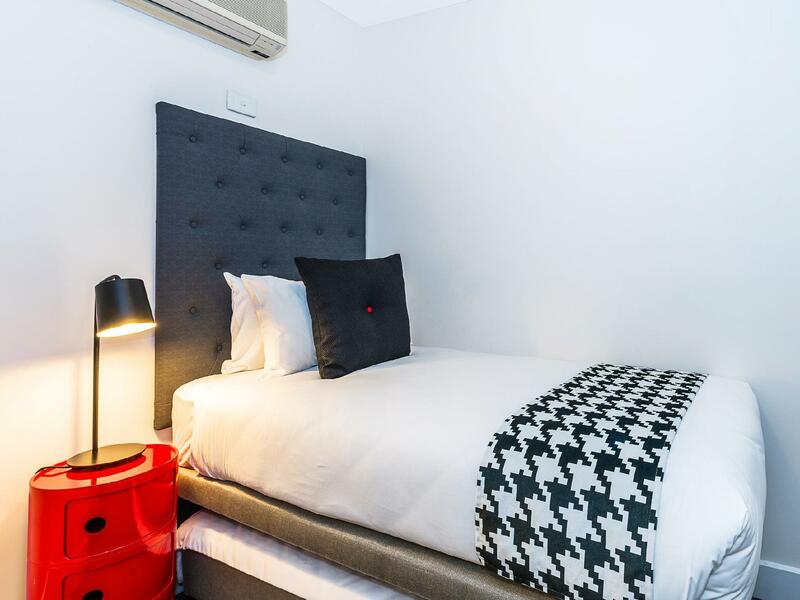 The staff were very friendly, the value for money was great and the location was absolutely fantastic if you want to be in the heart of the CBD and shopping district! Wonderful stay and will be visitng again soon. Thanks Mantra! Room was above lane-way that had live band playing from early afternoon until after midnight even on Sunday night . Noise was unbelievable . I realise it was coming from another establishment but a bit of forewarning would have been nice . Complimentary sugar and coffee was very scarce . Enough for one drink ? Really !! Stayed for 2 nights. Old building smack in the centre of town. Very friendly staff. 1 bed apartment perfect for our needs. Very comfortable bed. Loved the decor. Free wifi would make it perfect. Shame it doesn't have an onsite bar like the other mantra on little Bourke. The bar in the laneway next to the hotel was very much geared at the much younger crowd, who gave us the death stare when 4 "over 50's" walked in. We had a very good stay and were pleasantly surprised by how good the accommodation was. The staff were all very friendly and helpful. We would stay there again. We did not take advantage of the room service meals. Didn't have a good room at first, it was dark and small. The receptionist Jess was happy to put me to room 203 instead. That was a beautiful room with natural light, high ceiling and chandelier. The hotel is right next to the Emporium and short walk to the china town, that's basically everything! The only down side was it is closer to the street, and you can hear everything. Kept waking up due to the street noise. I'll definitely come back again but I'd request to be put to a higher floor. Central location. Friendly staff. Washing machine in room. Very good position on Little Bourke and Elizabeth. Walking distance to most places. Comfortable beds. Well-equipped kitchenette and washer/dryer. We had a one bedroom apartment which was quite dark because the windows looked out onto a narrow airwell but we weren't too bothered by the lack of a view. Staff on the reception desk were helpful and friendly. I would stay here again.